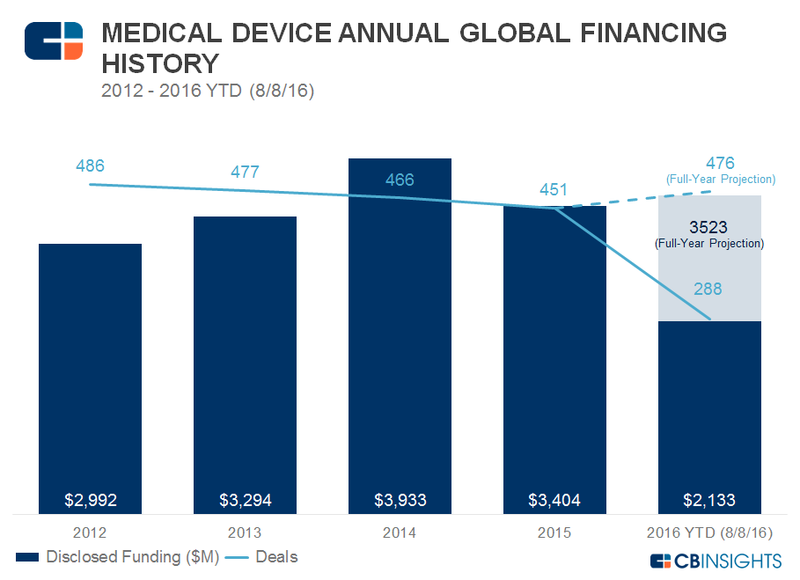 Despite a drop in the second quarter of 2016, medical device funding is expected to finish stronger this year than in 2015. 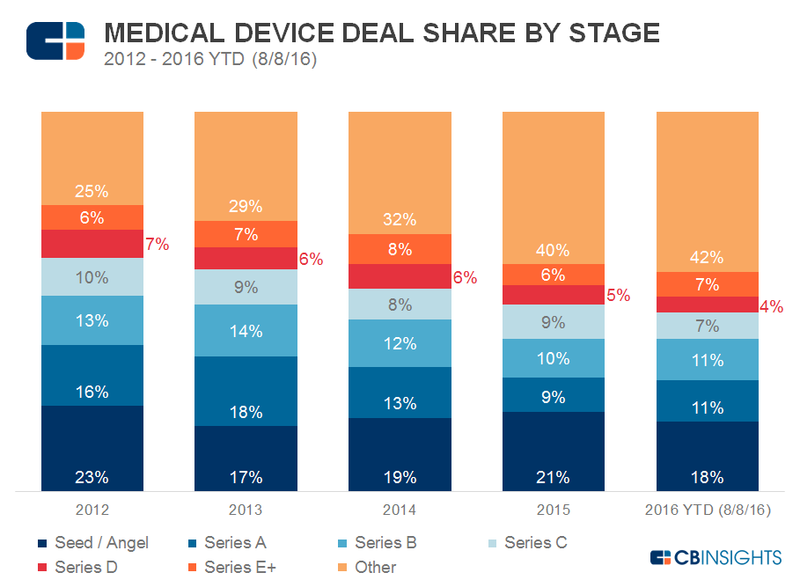 CB Insights has released a report on the funding and deal activity within the medical device industry since 2012. CB Insights reports that “after hitting a 4-year high of $1.5 billion in the second quarter of 2014, funding to medical device startups has sobered considerably.” Funding in 2014 was elevated by a $172 million Series G round secured by California based Proteus Digital Health. Overall, the medical device industry is on track for a modest increase in deals and dollars to private companies in 2016, after seeing a decline in both in 2015. As of August 8, 2016, funding and deal activity have reached $2.1 billion and over 288 deals. At the current rate, total year funding would reach $3.5 billion and total year deal count would reach 476 deals. The funding has been bolstered by $75 million in Series C funding secured by California based Acutus Medical in March 2016 and recent funds raised by Minneapolis based CVRx, $93 million in August 2016. The first and second quarters of 2016 are among 5 of the last 10 quarters to have 120+ deals. Funding in the first quarter of 2016 managed to break $1 billion, a feat that didn’t occur in 2015. However, the second quarter’s slip to $757 million saw the first sub $800 million quarter since the first quarter of 2015. The deal and dollar share by stage for 2016 looks to be similar to those for the last four years with early-stage deals, including Seed/Angel and Series A, making up 29% of total deal share to-date. The top three “Most Active Early-Stage Medical Device Investors” are reported as Germany based High Tech Gruenderfonds, Memphis based ZeroTo510, and Philadelphia based Ben Franklin Technology Partners. Interestingly, “Other” funding rounds have been trending up and currently represent the largest share of deals at 42%. “Other” includes corporate minority rounds, VCs, and convertible notes. The top medical device investor overall is reported as New Enterprise Associates with Versant Ventures a close second. CB Insights reports the top most well-funded medical device startup as Theranos, securing $400 million in total funding. Theranos was recently sanctioned by the U.S. Centers for Medicare & Medicaid Services (CMS) and banned from receiving Medicare and Medicaid payments. Each of the top five has raised upwards of $250 million. However, the funding figures exclude debt rounds and lines of credit. April White is an associate in our San Diego office. Prior to joining the firm, Ms. White attended law school at the University of San Diego School of Law. While in law school, Ms. White was an editor for the San Diego Law Review. Prior to her legal education, she received a Bachelor of Science in Mechanical Engineering from the University of Louisville. Ms. White joined the firm in 2015. This is fantastic information. The breakdown of the first and second quarter is great information. I just bookmarked this. Thank you.